Described by one scholar as the "perfect counterpart to Beato Angelico's paintings:"(*1) this highly finished, meticulously executed drawing was excised from a larger sheet of paper whose original function remains unknown. Visible along the left edge are traces of a precisely drawn architectural structure, possibly a doorframe or window with half pilasters surmounted by foliated capitals. Taking up the full height of the sheet is a monumental cross, viewed straight on and from below. Subtle contrasts of light and shadow accentuate every bone, muscle, and tendon of Christ's sinewy body, drawn in crisp, confident lines. Short, precisely rendered strokes of the pen describe in touching detail all of the nuances of Christ's physiognomy and delicate features, the single strands of hair in his beard and the curly locks on his head, and even the folds of skin at the knees. 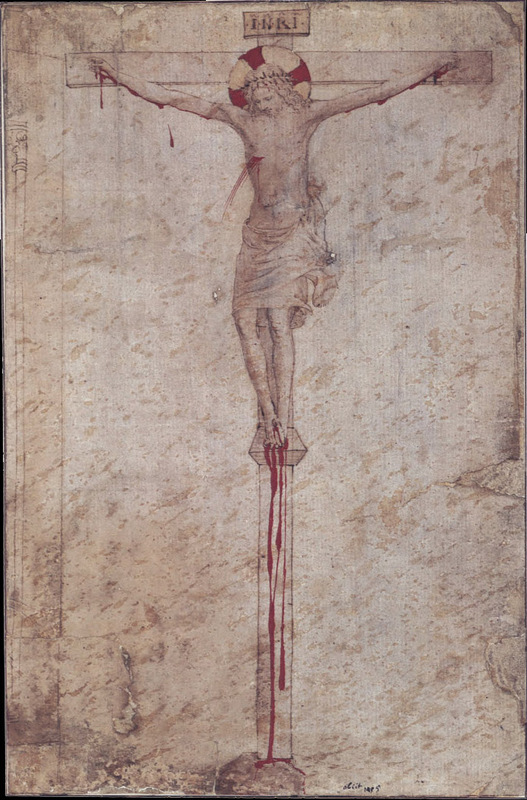 Underscoring the naturalism and pathos of the image is the brilliant red wash applied over the drawing to indicate the flow of blood from the wounds, a few drops of which appear dramatically suspended in mid-air against the empty background. Konrad Oberhuber,(*8) on the other hand, observed, correctly, that all the Crucifixion scenes painted in San Marco by Angelico himself, "or under his direction," appear to reflect a different phase in the artist's development, marked by a more monumental, classical approach to the human form, which is inconsistent with the frail, ascetic-looking figure of Christ in the Albertina drawing. According to Oberhuber, the nearest counterpart to this figure is to be found in Angelico's earlier production, as represented specifically by the small Crucifixion on the pinnacle of the Cortona triptych (fig. 64). Except for minor discrepancies in the position of the crown of thorns on Christ's head and in the folds of the loincloth, the image of Christ on the cross in this painting appears to be closely modeled on the drawing in every other respect, from the identical proportions of Christ's body, to the same round-shaped head inclined forward, the similarly pointed features, and the matching pattern of the blood flowing from the wounds. The dating of the Cortona triptych, which here is attributed to a collaborator of Angelico working over the master's design (see p. 160 n. II), has ranged from as early as 1430 to as late as 1438. (*9) A date for the execution of the drawing even before 1430 is suggested by its stylistic debt to a number of independent images of the Crucifixion executed by the artist in the previous decade. The earliest among these is a small, cut-out cross in a private collection in Milan, which was identified by Boskovits(*10) as a collaboration between Angelico and Lorenzo Monaco. It is in this work that one finds the roots not only for the figure type of Christ in the Albertina drawing but also for the Late Gothic decorative flourishes — most noticeable in the swirling folds of the loincloth — and precious quality of execution that prompted Berenson to dismiss the drawing as "too pretty" for Angelico. 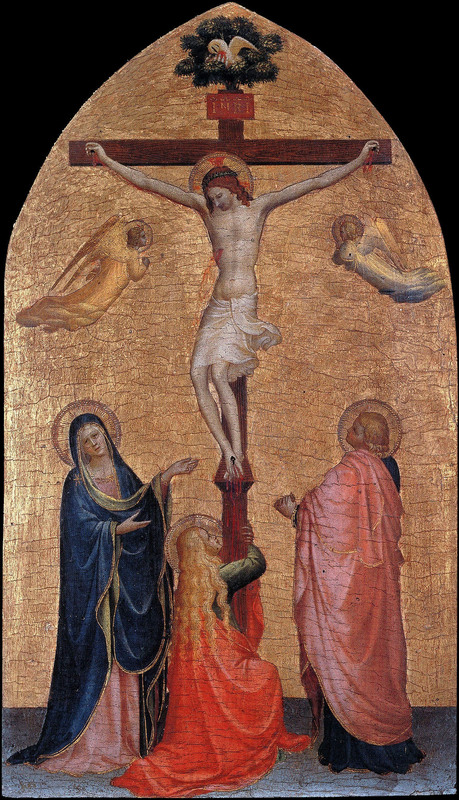 The same elements derived from Lorenzo Monaco, in fact, are evident in the Crucifixion panel in a private collection (fig. 46) and in the later Crucifix from San Niccolo al Ceppo, here dated about 1421 and about 1430, respectively. 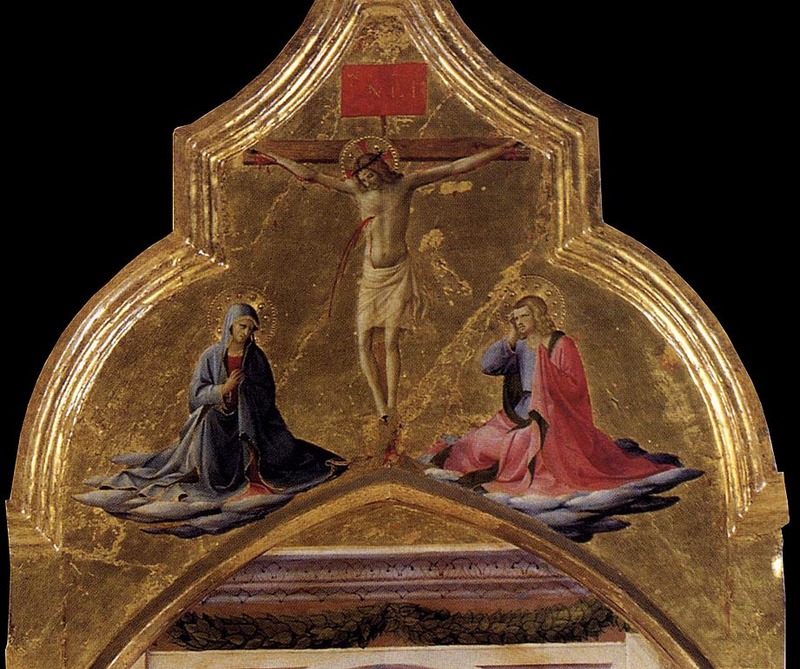 The Albertina drawing would seem to represent a middle phase between these two works - less Gothic than the private collection panel but not as Masaccesque, in the proportions of Christ's body, as the San Niccolo al Ceppo Crucifix. Although it has generally been assumed until now that the Albertina drawing was created as a study for a specific work of art, it is worth considering the possibility that, instead, it might have been included in a lost book of drawings similar in type and content to the so-called "Sketch-book" of Benozzo Gozzoli and his workshop, now divided between Rotterdam and other collections. (*11) The same model book also may have contained the drawing of Justice in the Robert Lehman Collection (cat. 23), attributed here to Fra Angelico, which, coincidentally, is virtually identical in its support and technique to the Albertina sheet. (*1). Benesch 1967, p. 320. (*2). WiddlOff 1892, p. CLXXXII S.R. 30; Schonbrunner and Meder 1896-1908, vol. VI, p. 702. (*3). Berenson 1903, p. 5 (as by an unknown imitator); Berenson 1938, pp. 5, 19 (as possibly by Domenico di Michelino); Pope Hennessy 1952, p. 205; Pope Hennessy 1974, p. 236 (as "after Frz Angelico"). (*4). Birke and Kerte. 1995, p. 1, 679 (with earlier bibliography). 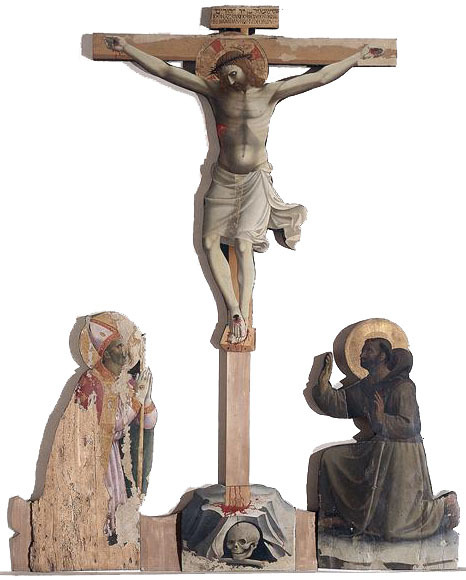 Bonsanti (1998, p. 160) lists the Albertina Christ on the Cross as the only other drawing, besides the British Museum David Playing a Psaltery (cat. 26), which may be confidently attributed to the hand of the master. (*5). Douglas 1900, p. 199. (*6). Benesch 1967; Degenhart and Schmitt 1968, p. 448. (*7). Degenhart and Schmitt dated the drawing between 1438 and 1446. Most scholars today agree that the frescoes were executed between 1438 and 1443 — or 1445 at the latest. See Scudieri 2004, pp. 18-21. (*8). K. Oberhuber, in Koschatzky, Oberhuber, and Knab 1971, no. 10, p. 33. (*9). See Spike 1996, pp. 196-97 (with earlier bibliography); Bonsanti 1998, p. 137. Without relating it to any particular painting, Bonsanti (p. 160) dates the drawing "perhaps a few years after 1430:"
(*10). Boskovits 1994. pp. 349-51,fig. 247. (*11). For the Benozzo Gozzoli album, see Elen 1995, pp. 222-26; Scheller 1995, pp. 369-80; Melli 2002, pp. 117-29.